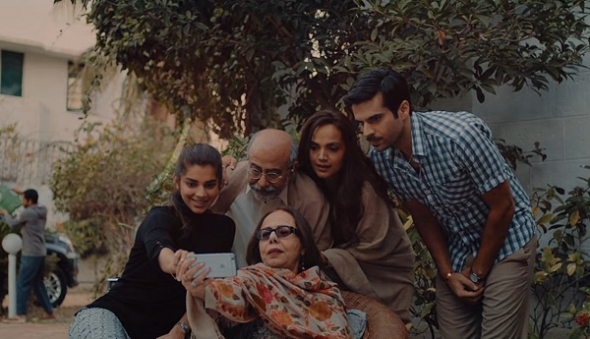 IT’S AN UNCONVENTIONAL story of sibling tension set in modern day Karachi where one sister, ‘Zareen’ (played by Aamina Sheikh) looks after her elderly parents. First, dad, Abba (Mohammed Ahmed) is ill – so, younger sister, ‘Zara’ (Sanam Saeed) – who has decamped to London for many years – is summoned home. There is clearly a strained relationship between the siblings who haven’t spoken for a long time, but we aren’t told why. Dad recovers, then mum Amma (Beo Raana Zafar) falls ill.
Zareen clearly resents being the ‘carer’ and sends romantic messages on her computer to someone called Romeo. He turns out to be a Christian man (played with smouldering intensity by Adnan Malik). She is in love with him – but the relationship is only hinted at, as he is of a different faith, and of a different class, and has a job on the their estate and is indebted to Zara’s family as landowners. (Saying more would be a spoiler, so we will refrain). The parents love the tunes of 1970s Indian films, especially the RD Burman, tune ‘Piya Tu Ab To Aaja’ (‘Beloved, please come now’), and things come to a head at their parents’ anniversary event in their ancestral village home. Abbasi is good at showing us a window into the life of the average Pakistani, trying to juggle modernity and feudal culture. The performance by the ensemble cast is fantastic and there is even a catfight between the sisters! Shot in Karachi, Sindh and London by cinematographer, Mo Azmi and edited by the Indian film editor, Aarti Bajaj and distributed by B4U Motion Pictures, ‘Cake’ enjoyed a West End premiere in London in front of many eminent Indian and Pakistani personalities, such as actor, Art Malik, Amit Bhatia, businessman and shareholder, Queens Park Rangers FC; producer, Naughty Boy; cricketer, Monty Panesar to name just a few and activist Malala Yousafzai last week too. The film also received the Best Director award at the 20th UK Asian Film Festival which just ended. It’s good to see Indians and Pakistanis collaborating in the production process and for an equally non-partisan audience come out and watch them and give their love to a talented cast and a movie with something to say to all of us. Inadvertently, the ban on Pakistani actors working on Indian productions has boosted local aspirations and ambitions and better films are emerging from Pakistan. I wanted to know more about the romance really – and do stay around for the credit sequence and you won’t be disappointed! And here’s Attika Choudhary accepting the Best Director Award on behalf of Asim at the UK Asian Film Festival (Mach 14-24).